Ireland Entworfen und gezeichnet von F. von Stulpnagel. 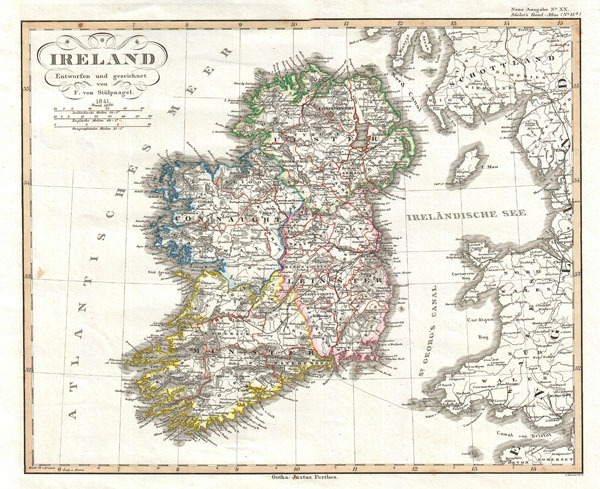 This is a fine early example of Justus Perthes' Map of Ireland. Shows the island divided into four districts: Ulster, Connaught, Leister and Munster. Shows roads, railroads, local political divisions and some of the surrounding waters and territories in England and Scotland. Drawn by F. von Stulpnagel and engraved by C. Metzeroth for inclusion as plate no. 15 in the 1841 issue of Stieler's Hand-Atlas.